Bryce in winter is sublime. Red and orange hoodoos draped and dappled with white snow present a fantasy land of forms and shapes, patterns and abstracts. Stark trees framed against undulating snow coax compositions impossible in warmer months. Cloudy, cold skies force a different photographic approach to the landscape, as well as briskly encourage you to keep moving and generate some heat. Serendipity is with you ... or not. Having just returned from Bryce Canyon National Park I can share some tips. To start with, Ruby's Inn is really your best choice for lodging. They offer special, very low winter rates and have the only open restaurant "in town" during that season. The rooms are nice, spacious, feature a refrigerator and microwave and have free Internet for those interested in immediately sharing images (as I was). One of the beauties of Ruby's Inn is that it is but 5 minutes from the park entrance with perhaps another 5 minutes to the first two prime viewpoints: Sunrise and Sunset. These two viewpoints coupled with Inspiration and Bryce, comprise the quadriad of viewpoints over the main amphitheater. For our two mornings in Bryce we chose Sunset and Inspiration, though you really can't go wrong setting up in any of the 4 viewpoints. The lowest of the points, Sunset puts you closer into the amphitheater with views both north (to Sunrise) and south (to Inspiration and Bryce, in order). You can also drop down a few meters or so on the Navajo Loop trail and catch first light on Thor's Hammer. It is a small viewpoint so with a lot of photographers I would find it untenable to maneuver (I like to shoot sunrises/sunsets with two bodies with different focal length lens on two tripods). I really liked Inspiration Point. There are three main "platform" viewpoints separated by a long ridge line. I actually choose the ridge line about 15 meters above the mid-platform. It afforded me an incredible panoramic view of the amphitheater but also allowed me to shoot south towards Bryce Point. I also loved the fact that I had a few tall pines that I could use as framing objects. Finally, not being bound by platform railing permitted to shift my tripods at will. Oh yes: did I mention that no one intruded upon my space! We arrived at the viewpoints each morning about a half hour before the sun rose. This allowed setup time, but more importantly, I love shooting the pre-dawn light and both mornings it was sublime. After sunrise, the place to be is down in hoodoos. The morning light (as well as the late afternoon) glows amongst the tall red rock spires. You want to capture that. The Navajo Loop is very nice but I really enjoyed the varying landscape and compositional possibilities along the Queen's Garden Trail. 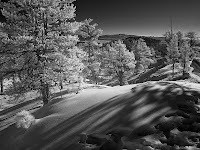 I used a variety of focal lengths -- 12-70mm -- as well as my infrared cameras. I was able to obtain some very effective images with the use of the latter. 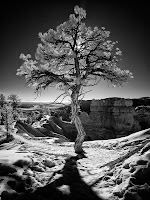 There are times when the stark contrast provided by IR produces far more striking photographs than conventional cameras. Additionally, we had one day of near-total overcast. It was a flat, non-colourful, "B&W day" and I chose to explore it predominately with IR. There is more to the park than the 4 main viewpoints and the amphitheater below them. The road extends another 15 miles south ending at the 1000 foot higher viewpoints of Rainbow and Yovimpa. The view south to Arizona from these points is amazing though unfortunately Navajo Mountain was shrouded in some bilious coal plant plumes. I was surprised and disappointed to see that. There are numerous view spots to stop at on the drive south, but frankly if you are time-limited, you'll be better served (photographically-speaking) by staying north. In fact just north of the main amphitheater is another fascinating area: the Fairyland Trail. 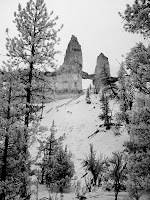 During the summer the 8+ mile trail can be completed in 3-4 hours but with snow the going is slo-o-o-o-w. We hiked the short section to Tower Bridge from Sunrise Point. The destination was a wee bit underwhelming but the journey was incredible. You quickly descend into a fantasy land of strange walls and pillars separated by silent fields of snow. We saw not a soul. Before dropping into the various basins inquire at the park ranger station as to the condition of the trails. I brought my snowshoes (they weren't needed where we went) but unfortunately left my Yak-Tracks at home. I really could have used the latter as there were quite a few icy patches with a steep pitch down-slope if you were not mindful. Since the last snow had been 10 days or so before our arrival, the trails were relatively well-packed and easy to follow. I would not want to be breaking trail or route-finding in fresh snow, however. Sunsets are somewhat of a non-event in Bryce. The amphitheater is in shadow, though the light on the Aquarius Plateau to the east can be stunning. I chose to be below Sunrise Point both evenings and the light was photogenically soft though there was no super dramatic sunset ops. The ranger informed as that a lot of photographers go to Red Canyon (west on Hwy 12, some 10 miles or so) for sunset shots. It seems the angle is better-suited for the sundown...next time perhaps. One suggestion: for the early-to-mid-morning and the mid-to-late afternoon wanderings through the hoodoos, you will encounter deep shadows. If you have never tried HDR photography, this would be a good time. Three-to-five shot brackets of 1.5EV will provide you with a wealth of dynamic range to play with. 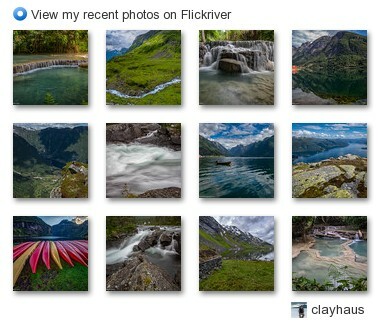 Even if you don't do HDR, think about bracketing. More often than not I found that the snow threw my internal meter off and I needed to shoot between +0.5 and +1.5EV. Finally, whether tangled up in the hoodoos, or high above surveying them from a viewpoint, think about pan shots. Whether you stitch or have a dedicated panoramic camera Bryce is a pan-maven's paradise. I brought our my now-discontinued Hasselblad XPan II and shot a whole roll between 8 and 10 am. I've always wanted to see and shoot Bryce in the winter. The weather gods treated us well and we were thusly rewarded. Hopefully you will be also.